為了慶祝 在2011春季Sugar 6的發佈, Sugar提供了相當優惠的價格: 以Sugar 專業版價格可取得 Sugar企業版 完整功能. 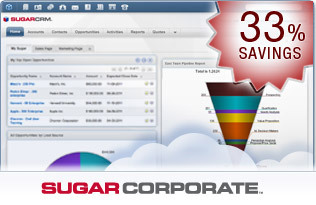 Sugar Corporate includes all the features of Sugar Professional and more, including Sugar Mobile Plus with offline sync. Sugar Mobile Plus 讓您的移動裝置可以離線使用後同步CRM資料: 在飛機上或者遠離你的收訊行動網路收訊範圍. 您可以更有效率產值的使用Sugar Mobile Plus 將會自動的同步任何更新當您重新連上網路後. Sugar Mobile Plus 在這個夏天將支援 iPhone, BlackBerry, and iPad. Android版本將在今年年尾提供.